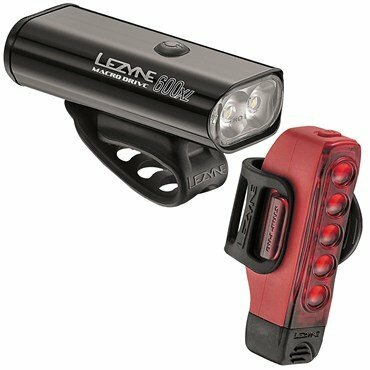 Whether you’re cruising after hours, commuting home or simply a night owl the Lezyne Macro Drive / Strip Pro light set is for you. Both lights feature tough shells that keep the elements out of the internals. A rubber end cap conceals the integrated USB stick for easy charging from any USB port. Both the Macro Drive and Strip Pro easily attach to a wide range of handlebar / seatpost diameters via an integrated strap for tool-less installation. Delivering a huge 600 lumen output the Macro is designed to see and be seen with. Excellent side visibility sends the powerful beam out 180 degrees. This enhances your visibility at crossings, junctions and roundabouts. A new ‘Femto’ light modes has exceptional battery life from a low light 15 lumen beam - ideal for daytime riding. There are 6 other light modes to choose from giving you plenty of options in a range of riding conditions. At the rear the Strip Pro light delivers an impressive 100 lumen. For a rear bike light a 100 lumen is strong indeed. The beam is angled down so the road behind you is illuminated without dazzling drivers. A new Memory Mode function ensures the light will always return to the last mode you used whenever you start up the Strip Pro. This means no more cycling through modes to find your favourite. Lezyne have designed the Strip Pro to be compatible with aero seatposts for fast-paced roadies. Macro Drive Front - New Mode Memory function – returns to last selected mode each time light is turned on. Macro Drive Front - New ‘Femto’ mode gives exceptionally long run time with low lumens. Macro Drive Front - New integrated mounting strap to work with a variety of handlebar shapes and diameters. Macro Drive Front - Uniform Power Beam "MOR" twin lens for increased output efficiency. Strip Drive Pro Rear - New Co-moulded construction to seal against weather. RGB Intelligent Power Indicator button acts as fuel gauge and charging indicator. 2 Amp charging capable via optional HE adaptor for reduced charge times. Macro Drive Front - Seven modes: Overdrive, Blast, Enduro, Economy and Femto solid modes, two flash modes.